Twenty one. Twenty one more days guys. Twenty one more days until Thanksgiving. Are you ready? I'm not, but I'm working on it! 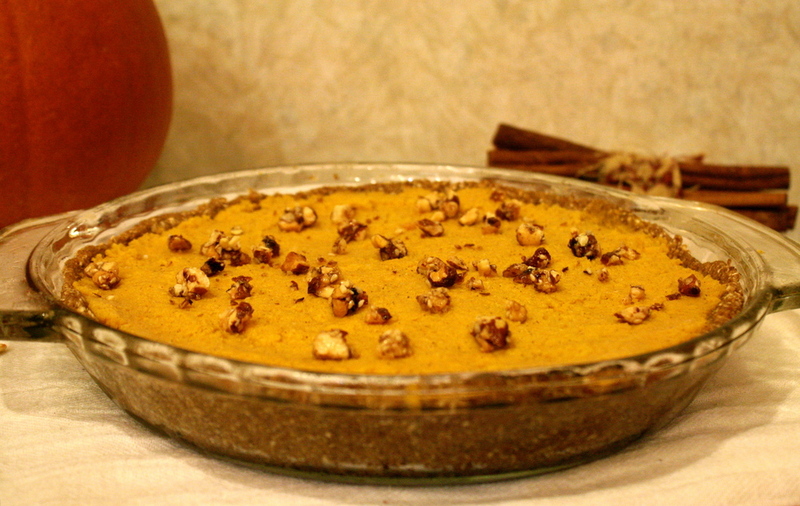 And what better way to do that than with this pumpkin pie? I can't think of any better way, honestly. This is my first vegan Thanksgiving. I'll be making all of my own food this year and I want to share everything I plan to make with you guys before the big day comes. So get ready for these next two weeks, I'm taking you guys are quite a delicious ride. In a food processor blend together ingredients and spread into a 9 inch dish. Set aside. Then blend together pie filling ingredients in food processor; blend until completely smooth. Dish filling into crust and place in the refrigerator for 5-6 hours or place in freezer for 2-3 hours. Serve, enjoy!